Signed by the engraver with his monogram in the plate. 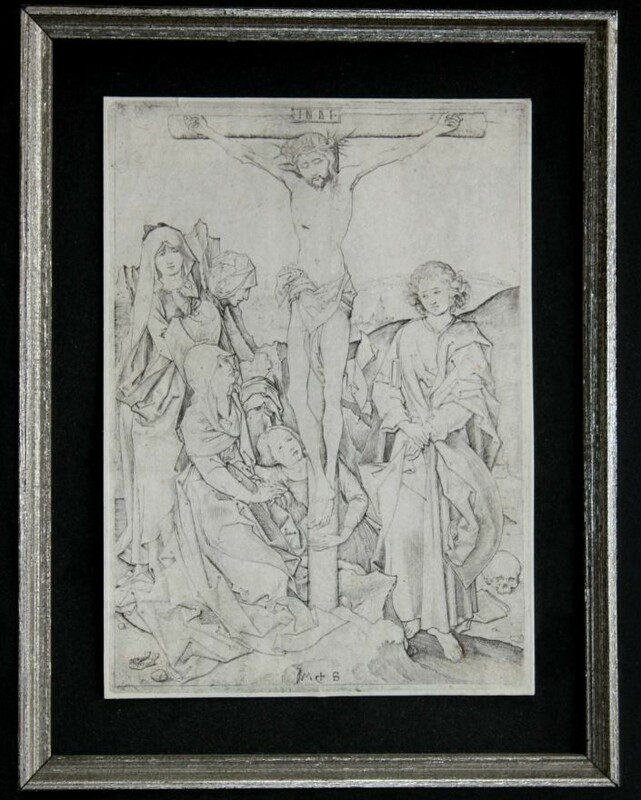 In this engraving by the fifteenth century printmaker, Martin Schongauer, the artist’s rendering of the Crucifixion emphasizes tragic and emotionally evocative themes that characterize the tradition of Christian devotional images in the late Middle Ages. 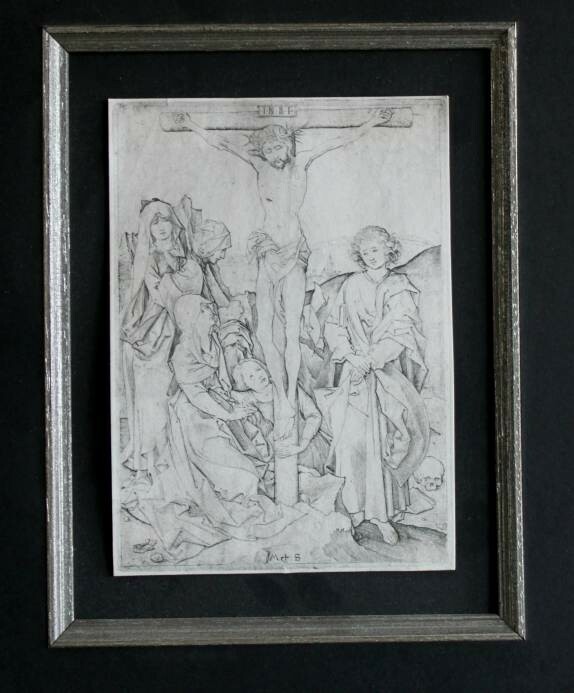 Schongauer conveys emotion through the expressions and body language of his figures and through their gestures and attitudes toward the central subject matter, the crucified body of Christ. The artist’s composition divides the print into two contrasting fields, bottom and top. The bottom two-thirds of the picture is dark and crowded with Christ’s mourning followers, in contrast to the top third, into which Christ’s naked torso projects, raised above the earth by the cross, presented to the viewer with stark clarity against an empty sky. Nailed to the cross and elevated within the composition, Christ’s gaze is tilted downward toward his mourning followers and is portrayed with a despondent countenance. In contrast, the gaze of the Virgin below connects with his and directs the audience upward towards Christ. 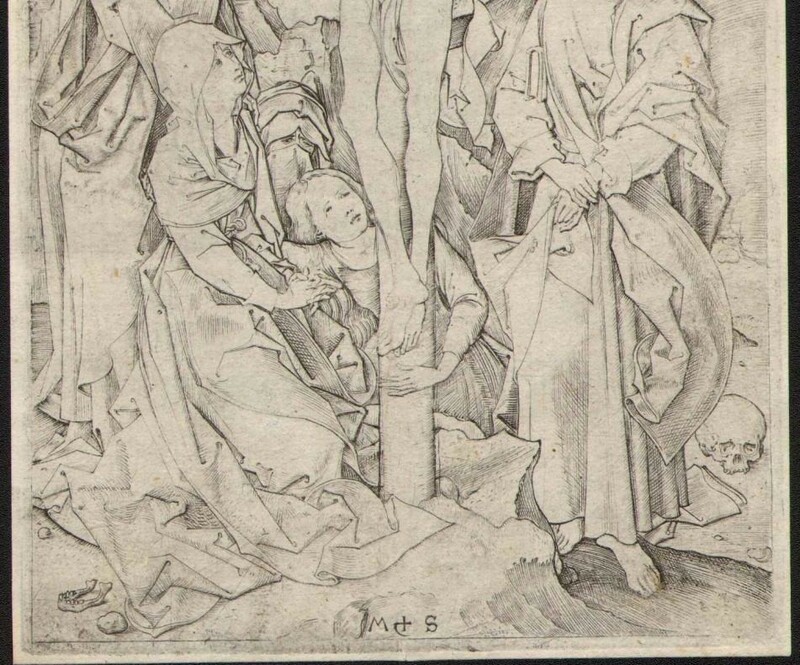 This same vehicle used by the artist to assert the hierarchy of figures is common to images of the Crucifixion and can be seen dramatically in Heinrich Ter brugghen’s Crucifixion from a century later. 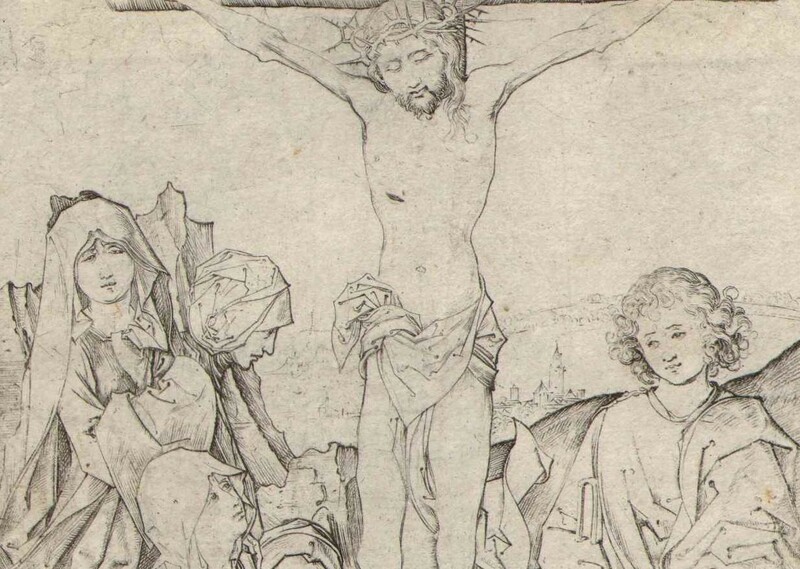 Schongauer depicts Christ’s body as thin and emaciated by showing the contour of each muscle and rib bone. On his chest is a puncture wound and on his head, the spiky crown of thorns, a key symbol of the Passion. Above Christ’s head reads appears a titulus with the inscription ‘INRI,’ which is the Latin acronym of ‘Jesus of Nazareth King of the Jews’ in Latin. Under Christ’s feet, Mary Magdalene wraps her arm around the base of the cross, looking up at her savior. Magdalene’s head, neck and arm appear with great formal clarity against the composition’s dark, confused muddle of bodies and clothing. Likewise, the depiction of the Virgin, who kneels next to the Magdalene, presents a clear, lucid view of the Mary’s expressive face and hands. Above them, Christ’s torso appears against a background devoid of detail. Through this compositional choice, Christ is elevated above the chaos of the earthly world and is exalted into the clarity of heavenly grace. This technique of elevating the body, isolating Christ in the viewer’s focus above a confusing, densely crowded space is not unique to Schongauer’s print. A mid-fifteenth century German painting of the Crucifixion (Fig. 2) employs a nearly identical approach to composition. Such works conveyed a devotional message to the audience, elevating the body of Christ just as the Host was raised and lowered in the performance of Eucharist, insisting my means of composition that the viewer’s focus should be on the Crucified. 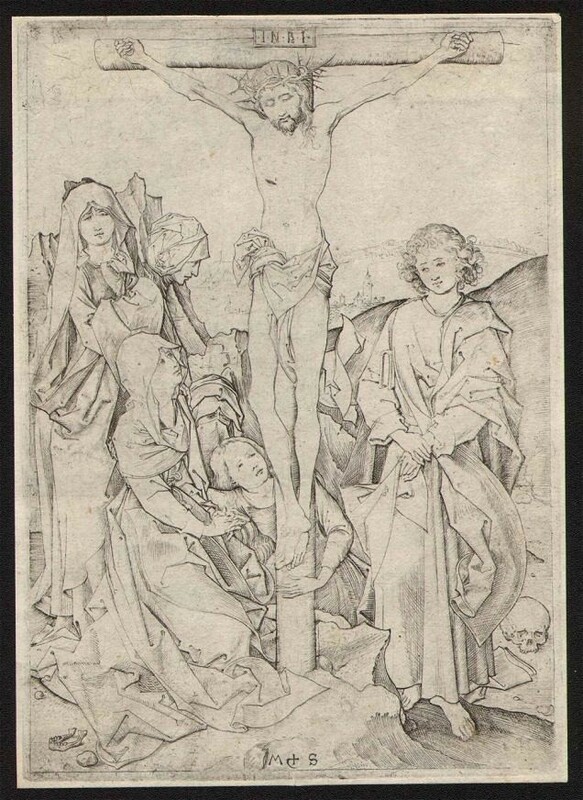 Though Christ is the primary focal point of the composition, Schongauer develops the faces, expressions, and gestures of the persons around the cross as secondary points of emphasis. Their attitudes mourning and anguish are meant to serve as models and guides for the viewer’s response to the sufferings and sacrifice of the savior. Mary, mother of Christ, hands clasped and held down in front of her, she gazes up at her son with an expression of grief and heartache that recalls other contemporary images of the Virgin at the cross, as in a sculpture from the Naumburg choir screen . Mary’s lifted gaze creates a tension of gaze with her clasped, twisted hands and arms extended in the opposition direction in a physically taut gesture of anguished pleading. To the right of The Virgin are two more female followers of Christ, identified with the Biblical figures Mary of Clopas and Mary Salome. The taller Mary is shown in a more frontal perspective and, like the other characters of the scene, weeps for the crucified Christ. The head of the third Mary is behind the standing figure and is shown in profile. Her head is bowed in the direction of the Crucified. These two women, through their relationship to Mary as much as to Christ, underscore the emotional turmoil that afflicts the mother of Christ. Often, the Mary’s are depicted directly comforting Mary in her sorrow rather than mourning Christ, as in a Crucifixion by Konrad von Soest from 1414 . To the left of Christ is St. John the Evangelist. He looks down with a sorrowful expression and his hands are laid down and crossed in front of him. He is dressed in a heavily draped cloak and is shown with bare feet, a symbol of humility. The saint’s hair is delicate and unkempt adding to the poignancy of his expression. In these diverse pained looks and physical signs of emotional distress, the fifteenth century viewer would find reflections of the actions and emotions that he or she sought to experience in response to a mental and artistic image of the Crucifixion. To the right of St. John’s feet is a skull on the ground, which refers to Golgotha, the “place of the skull,” considered the burial place of Adam in medieval tradition. The setting and background of this work are supporting elements. The foreground of the scene is depicted as a rocky and barren landscape. The background consists of a few hills and a small rendering of Jerusalem in the distance. Schongauer simplified his background and landscape. This simplification allowed for the figural elements to “be lifted above participation in action” to become symbols of the events they portrayed.This is significant in understanding the way in which the artist composed his work to support the private, devotional purposes of art in late medieval Germany. 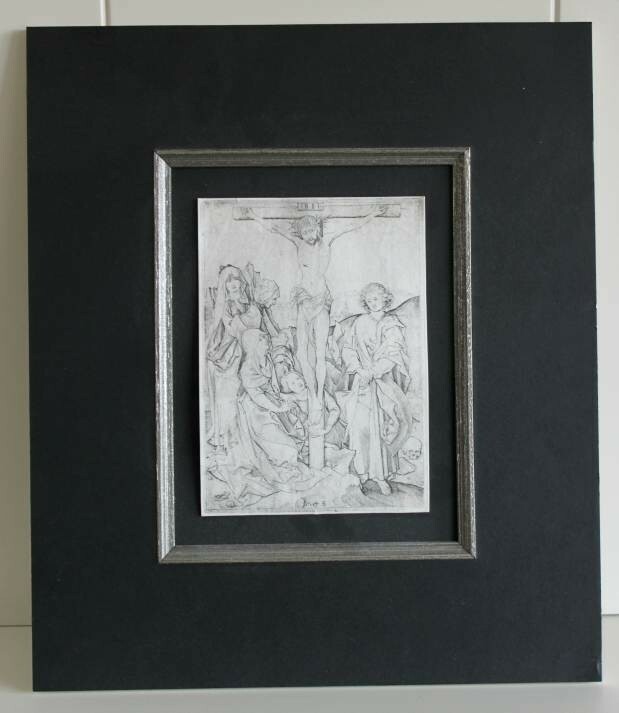 Schongauer’s print represents a significant shift that occurred in fifteenth century European art. Prior to the fourteenth century, art was highly stylized and veered away from portraying characters in a realistic way, but with a newfound focus on empathy, on spiritual-emotional connection to the distant figures of the Bible, there is a return to a more naturalistic style that rendered an emotionally engaged experience for the viewer.Because of this new shift towards individual worship outside of the church during this period, devotional images played an increasingly important role in the relationship between the faithful and God. Devotional images that created a personal and emotional connection illustrated how patrons could better relate to, visualize and meditate on the events in the lives of the Christ and the saints.